Greek Mythology. Such a rich history and yet there seem to not be all that many vintage and public domain Greek mythology images to be found. It’s been since 2009 since I’ve shared a bit of history with you. A 1912 work with Aesop’s Fables illustrated by Arthur Rackham (1867-1939), a well-known English book illustrator and included this Satyr drawing. In Greek mythology, Satyrs are male, goat-like creatures. They were companions of Pan and Dionysus. The had tails and ears like goats. They walked upright like a man but stood on feet with hooves. Early mythology has the creatures being quite fearsome. Through the ages, their features softened and became more human-like. 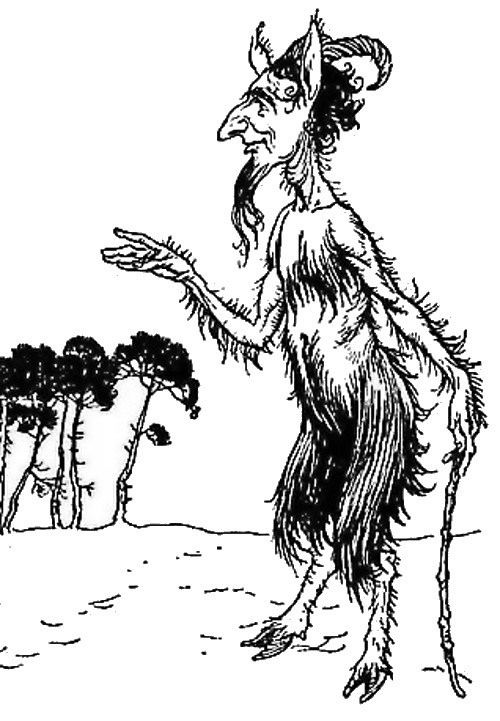 The Satyr and the Traveller, one of Aesop’s Fables, features the satyr as the benevolent host for a traveller in the forest in winter. The satyr is bewildered by the man’s claim to be able to blow hot and cold with the same breath, first to warm his hands, then to cool his porridge, and turns him out for this inconstancy.